The idea behind unique identification number was to assign each individual a unique 12 digit number which will help to identify the individual uniquely. The objective was to attach all the bio-metric and demographic data of an individual with a 12-digit unique identity number called Aadhaar. The bio-metric and demographic data of individual will be stored in a centralized database. The act related to Aadhaar was initially introduced as a money bill in the parliament of India on 3rd March 2016. The bill was passed in the Lok Sabha on 11th March 2016 and on 26th March 2016, this bill became an Act. The process of issuing the unique number and collection, maintenance and updating of bio-metric and demographic data related to each individual is done by the Unique Identification Authority of India (UIDAI), which is a central government agency of India. With the issuance of Aadhaar card, India has entered the group of countries which has national identity cards for its native residents. This process of attaching all the legal data of an individual with a unique number is an attempt of India to develop a secure system of identification and have a long term impact. First recommendation of any such identity number was after the 1999 Kargil war by the Kargil Review Committee to then Prime Minister of India, for the security and authenticity reasons. With the centralized database of each individual it became possible for security agencies to access information of each citizen under certain emergency situation in the interest of national cause. By considering the population of India, it was necessary to have such secure identification system for controlling illegal migration and anti-national activities. By connecting Aadhaar number with banking system government has created a proper and secure channel through which beneficiaries receive all the subsidies directly to their bank account. It has eliminated the role of middleman and agents thus helping the poor and the Indian Economy. With the help of UID it became possible to identify the native Indians and illegal migrants and thus helps to ensure that only the Indian citizens and the legal migrants get benefits of government schemes and also employment. As all the bio-metric and demographic data of individual is linked to Aadhaar, it helps to identify the families that really belongs to BPL (Below Poverty Level) and hence providing them employment under NREGA (National Rural Employment Guarantee Act) and also easy and prompt payment to the actual workers. Another big issue which can be addressed trough UID is real number of voters. Rural to urban migration is highly prevalent in India. Thus they enroll their names in voter list of both places and politicians take ill advantage of such situation. But by implementation of UID it will not be possible for any individual to posses more than one voter identity card. Government of India could save 15000 crores till 2016 by linking bank accounts with aadhaar for the LPG cylinder subsidies. Aadhaar based bio-metric attendance will make a good impact in government offices where mostly people try to escape from their work. UID will also help indirectly in controlling the corruption. For a nation like India with such a large population, it becomes matter of security risk to handle such a large data of individual associated with their UID. No proper provision of law and punishment if any misdeed occurs such as the leakage of personal information of citizens. Assigning UID to such a huge population with authenticity is also a big challenge as no prior documents asked for it. Providing all the information associated with Aadhaar and creating awareness in the public is also a matter of concern. UID for every Indian is a very good system for eliminating agents and commission culture from India. It will help the poor to get their benefits directly to their accounts. It will also help in eliminating the illegal migrants from India and thus controlling the anti-national activities. But the implementation and execution must be done in a proper and prompt manner. And there must some guidelines related to risks associated with the system. in my opinion by adding qualification to it we can easily found the fake employees who are in job by provided fake certificates. it may take many updations all over the country but this will reduce the many of such people. and we can easily attend any interview without taking a single paper. it will be success only through proper implementation. Unique Identification Number is a 12 digit number which will help to identify the individuals uniquely provided by UIDAI. With the issuance of aadhar card India has entered the group of countries which has national identity cards for its native citizens.But because of improper security systems this process has some loopholes which have resulted in the misuse of individuals data. Linking of mobile numbers and issuing of sim cards with aadhar cards from any local outlets have caused many people to loose their data because they inappropriately save the aadhar numbers and issue multiple sim cards on the same UIN & sometimes also sell the data which can cause harm to the people. Although linking of UIN with banking system has benefited govt. by having a close check on individuals transactions thus helping in taxation purpose but still the implementation of such policies should be done with proper security systems. UID for every Indian is a very good system to eliminate agent and commission culture in India. It will help the poor and they get their benefit directly to their account. It will also help in eliminating illegal migration from India and in monitoring the anti-national activities but the implementation and execution must be done in a proper manner. Unique identification number is most important in Very person and also proof of person myself. UID no is most important in our lifes because all work apply to demand the UID and uses in every work. According to me every Indian should required unique identification number then it can easily identify the native or illegal migrants, we used to see thousands and thousands peoples were coming from other countries and they are permanently staying in India as a result population is increasing, it should be controlled. Secondly those involved in the bad activities like smuggling, rubberise , raket etc police can very easily identify them. Thirdly middle man role eliminated, poor people they are getting benefit directly ,we used to see aid was coming from Central Govt.onthe way to poor people half of money has been vanished.Fourthly Aadhaar should link in every sector . For example if people purchase something they have to provide Aadhaar number above centain amount ,now we purchase flight ticket we provide Aadhaar number . Government should impose if we purchase train ticket for distant place we have to provide Aadhaar number.But central Agency Should very strict any data should not leak and if somebody use fake Aadhaar he should be punished like penalty and jail.It will take time to make it successful. Although it is required everywhere and every sector…but what about the security.In a country like India where such a large population exists is it possible to verify everyone’s id.for eg. If a person travelling by train uses a fake UID no one gonna check or verify it online that whether it’s true or not.The thing that matters is just the money(nothing new).it happens before,even now and the matter of big sorrow, but may be this will be the same. yes you are right.. as no proper provision is made for the security of this system so its quietly usual to happen the issues like this.. but i think it will be good if the uid is verified during the process of issuing of the ticket.. that means the authorities should have a proper website or application to check whether the uid is original or fake. But making UID no. as a phn no. may create risk.As many hackers are growing,making our UID no. Public may give chance to many hackers.UID no. Is database of individual accounts too so I think its not appropriate making ones UID no. as phone no. True! It is also a compromise on privacy. 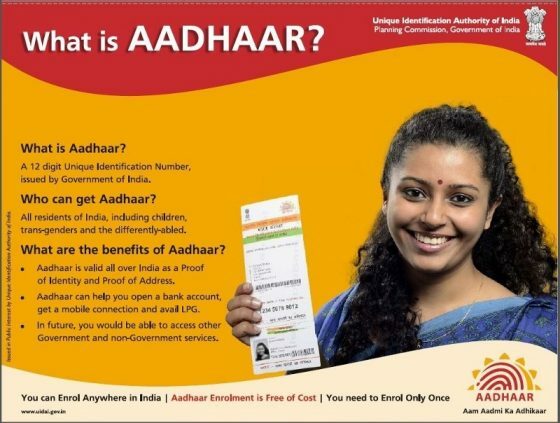 UID number for every indian,its a good move taken by indian govt. as we all know in india there are need to carry many document for verification & all, once the all document connect with aadhar no. its easier for every person and no need to carry every document. With the help of UID no. all individual data will be online so its very easier. In future if telecom tehnology will gro so we can use our UID no. as mobile no. so its easier to remember. In india people are making many fake identity with the different different name but in UID no. people cant do that, there is need for every individual eye & thumb impression so people are anable to make many identity. Using UID no. as mobile no.. That’s an innovative thought! Yeah no doubt in Indian there should be unique number for every citizen. because by the help of it we can’t only define or recognize any terrorist and citizen. But we also get any fund which will be allocated by our central or state gvt. And we know very well Indian is a large populated country. So somewhere it is necessary for security. This id number is so easy any we can easy apply it with any work. Presently it is required every where and every sector……..
UID number is one of the best schemes those have been run by our government. But with this we should know from where we accepted it ? what are the related shemes to this in the world? Which country is the first introduce this scheme?